Bamboo Innovator Insight (Issue 62)§ The weekly insight is a teaser into the opportunities – and pitfalls! – in the Asian capital jungles. § Get The Moat Report Asia – a monthly in-depth presentation report of around 30-40 pages covering the business model of the company, why it has a wide moat and why the moat may continue to widen, a special section on “Inside the Leader’s Mind” to understand their thinking process in building up the business, the context – why now (certain corporate or industry events or groundbreaking news), valuations (why it can compound 2-3x in the next 5 years), potential risks and how it is part of the systematic process in the Bamboo Innovator Index of 200+ companies out of 15,000+ in the Asia ex-Japan universe. § Our paid Members from North America, Europe, the Oceania and Asia include professional value investors with over $20 billion in asset under management in equities, some of the world’s biggest secretive global hedge fund giants, and savvy private individual investors who are lifelong learners in the art of value investing. “Most people would think that it has been one straight line to get to where we are today,” the dynamic founder of Myanmar’s #1 systems integrator said thoughtfully to our group. “Because of the banking crisis in Myanmar in 2003, we find ourselves in a situation whereby a substantial part of our revenue and operating cashflow disappear as our banking clients stopped their IT projects”. The 2003 banking crisis in Myanmar saw the collapse of more than a dozen deposit-taking companies. Their owners had used depositors’ funds to build up their own diversified business interests. Depositors went unpaid and a panic ensued, resulting in a bank run – and an underdeveloped banking system with low trust amongst many depositors who remained wary of putting their hard-earned money in banks till today. This is one of the many positive uplifting entrepreneurial stories that we have carefully collected during our official study mission trip to Myanmar from 7 to 16 Dec. During the trip, our group are privileged to have the invaluable opportunity to learn the art of business strategy from visiting the leading companies in Myanmar where we had visited the factories and facilities of diverse industries, including having up-close-and-personal interactions with outstanding business leaders and top government officials. Let’s face it, most of us are oftentimes paralyzed by the many obstacles that lie ahead of us. As we watch in awe as some seem to turn those very obstacles, weaknesses and misfortune into strength for themselves, we start to think: How do they do that? What’s the secret? Do they have a method and a framework for understanding, appreciating, and acting upon the obstacles life throws at them? If so, this critical insight will have tremendous implications for value investors in Asia and emerging markets which are rocked by a meltdown in local currencies which hit a 14-year low against the US dollar last week and a potential prolonged economic and credit hangover that will carry forward into 2015. Emerging markets have collectively borrowed $5.7 trillion in US dollars, a massive credit risk weighing down on the emerging markets index which has tumbled 17% since Sep 3, pulled down by falling oil prices and debt concerns from Russia. It has been estimated that over $500bn of petrodollars a year are recycled back into the financial markets and their evaporation as a result of the plunge in oil prices has exacerbated the parched liquidity conditions in the credit markets. In an ominous parallel, the emerging market index fell almost 60% between Jul 1997 and Sep 1998, when oil prices tanked and emerging-market currencies began a freefall amid a Russian debt default. The shared component in the emerging market misery is economic recovery in the western developed markets that include a stronger US dollar and a new gold rush in the Silicon Valley. As we ponder the entrepreneurial fundamentals of selected Asian innovators pitting against the fickle emerging market sentiments, we are reminded of Intel’s Andy Grove wisdom that “Bad companies are destroyed by crisis. Good companies survive them. Great companies are improved by them.” Myanmar’s #1 systems integrator was established in 1997, during the 1997/98 Asian Financial Crisis, as are half the companies in the Fortune 500 that were started during depressions or economic crises: FedEx (oil crisis of 1973), Charles Schwab (market crash of 1974-75), Microsoft (recession in 1973-75), Costco (recession in the late 1970s), Hewlett-Packard (Great Depression 1935), UPS and General Motors (panic of 1907), Fortune magazine (90 days after the market crash of 1929), P&G (panic of 1837), Coors (depression of 1873), LinkedIn (2002, post dot-com bubble) and so on. During the study mission to Myanmar and over the decade plus in the Asian capital jungles, we find that selected Asian innovators are able to steal good fortune from misfortune because they had the ability to see obstacles for what they were, the ingenuity to tackle them, and the will to endure a world mostly beyond their comprehension and control. They were busy existing in the present, dealing with the situation at hand, dealing with things as they happen. Importantly, they saw in each and every one of these obstacles as an opportunity to practice some virtue: patience, courage, grit, humility, resourcefulness, and creativity. Like oxygen to a fire, obstacles became fuel for the blaze that was their ambition. Every impediment only served to make the inferno within them burn with greater ferocity. Thus, The Obstacle Is The Way is undoubtedly the Phrase of the Year for these entrepreneurs and innovators. It is also the title to the profound book by Ryan Holliday who had apprenticed under Robert Greene, author of the 48 Laws of Power and Mastery which we recommended in our earlier articles and in the Value Investing Seminar 2014 in Trani, Italy. 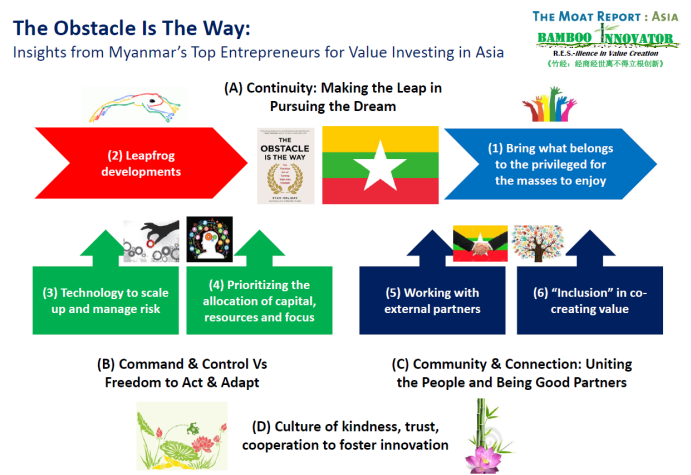 Inspired by the book and by our experience in the study mission to Myanmar, we crystallized our insights into a framework about the 4Cs: (A) Continuity – Pursuing the dream, (B) Command and Control vs Freedom to act and adapt to the local market conditions, (C) Community and Connection: Uniting the people and being good partners, and (D) Culture of kindness, trust and cooperation to foster innovation and cultivate resilient growth. We hope that this framework will also prove as a guide for value investing in Asia in 2015 in identifying and evaluating the type of unique business models which can grow resiliently and scale up in the turbulent and uncertain times ahead. Rockefeller: In his early working career, Rockefeller was caught in the Panic of 1857, a massive national financial crisis that saw businesses failed and the price of grain plummeted across the country, resulting in a recession that lasted for several years. Instead of lamenting his misfortune at this economic upheaval, Rockefeller eagerly observed the events that unfold as an opportunity to learn, watching what others did wrong. Rockefeller went on to seize advantage from obstacle after obstacle in his life, during the Civil War, the panics of 1873, 1907 and 1929. Edison: In 1914, the factory of the legendary inventor was engulfed in fire and the cruel fire destroyed his life’s work. Instead of crying in sadness or yelling in anger, Edison told his 24-year-old son, “Go get your mother and all her friends. They will never see a fire like this again.” At the scene of the blaze, Edison was quoted in the New York Times as saying, “Although I am over 67 years old, I’ll start all over again tomorrow.” Edison stuck to his word and immediately began rebuilding the next morning, without firing any of his employees. Edison had lost $23m in today’s dollar in the fire, and this is not including years of priceless records and prototypes. After just three weeks, with a sizeable loan from his friend Henry Ford, Edison got part of the plant up and running again. His employees worked double shifts and set to work producing more than ever. Edison and his team went on to make almost $10 million four years later, in 1918. The phrase “The Obstacle is the Way” serves to illuminate the mindset and driving force of selected wide-moat compounders who are able to create value in difficult times – and will be an incredible advantage for us in our own fight against Obstacles. We like to wish our readers a Merry Christmas and a Blessed New Year 2015! Our monthly Moat Report will be out on in the week on 5 Jan. Thank you for your support all this while! (1) Are companies audited by Baker Tilly HK more prone to accounting fraud? What are the firm characteristics e.g. state-owned companies vs privately-owned enterprises? Are they from certain industries? Are they structured as offshore holding companies? Generate the list of Baker Tilly audit clients and do some analysis..
(2) Do different audit firms have different policy in their audit of related-party transactions of Asian/ Chinese companies? (3) Why has US SEC struggled for years to obtain information for dozens of accounting fraud investigations at China-based companies? (2) How can the management abuse their application of “shared power” in consolidating VIE? What is the accounting policy take on discretionary changes in the exercise of this power? We hope the website will develop into a thought leadership platform on accounting fraud in Asia with analyses and opinions from participants and expert guest speakers in the course as well as from global experts. We are an admirer of the Institute of Design at Stanford in terms of its unique curriculum design as our benchmark and we strive to make improvements over time with your valuable feedback and comments. If you would like to contribute an article to this thought leadership platform on accounting fraud in Asia, please drop us an email at: asianextrator@gmail.com or bambooinnovator@gmail.com. PS2: Below is the short address made on 15 Dec by KB in the dinner event hosted and organized by Inter Group that marks the success and closure of Singapore Management University’s first official study mission trip to Myanmar. The special dinner event provides an extended platform for SMU student delegates to interact with business leaders. During Singapore Management University’s official Study Mission trip, our students are privileged to have the invaluable opportunity to learn the art of business strategy from visiting the leading companies in Myanmar. What really matters more than anything is character. The character of the people determines the quality of the institution. Strong institutions are about systems and people as much as new regulations and laws. We are grateful that our students are able to have up-close-and-personal interactions with outstanding business leaders of Myanmar. They represent the future of Myanmar with their strong sense of national pride and collective commitment that has inspired confidence in spite of – or because of! – the daunting challenges ahead. Our delegate are most fascinated by the resiliency of the Myanmar people who are like the Bamboo which bend, not break, even in a storm that would snap the mighty resisting oak tree. It survives, therefore it conquers. And the Bamboo also represents the value of uprightness and the art of springing back after adversity: In winter the heavy snow bends and covers the bamboo, the bamboo patiently waits for the snow to melt down and then snaps back up tall again, brushing aside all the snow. And in the end, the bamboo stands tall, evergreen and beautiful. Noteworthy is the invisible intricate underground root structure that makes the ground around a bamboo forest very stable – and make possible the flexibility and adaptability of the bamboo innovator to bend, not break, with the wind. To translate potential into sustainable growth requires the building of these intricate root-like institutional and market capacity and capabilities to manage the winds of opportunity – and potential risks – blowing in Myanmar. Three of our SMU students – Alvina Ow Swee Ting, Ringo Tan Chuan Hong and Charles Chen Siyang – will represent our SMU delegate to present the findings and reflections from our study mission under the central theme of Sustaining Transformation in Myanmar. We hope that the findings and framework will be useful and practical in helping the global business community understand more about Myanmar. This framework is about the 4Cs: (1) Continuity – Pursuing the dream, (2) Command and Control vs Freedom to act and adapt to the local market conditions, and (3) Community and Connection: Uniting the people and being good partners. We will reveal the fourth C at the end of their presentation. Following which, our SMU delegate will like to sing a few songs with meaningful lyrics to express our heartfelt thanks and blessings to the people of Myanmar. Let us now give a warm applause to Alvina, Ringo and Charles who will share with us their findings and personal reflections. The fourth C is Culture. The Culture of kindness, trust and cooperation to foster innovation and cultivate resilient growth. Kindness is like water nourishing the powerful roots of bamboo. Bamboos are found most abundantly along the waterways, among the rice paddies. A true test of kindness, which is harder than empathy towards failures, is joy at other people’s success as a result of doing the right things – a rare virtue that Buddhists call mudita. Kindness is also an inner revolution; as are reform and innovation. We are able to put less in our possession and more in people. The boundaries between us and others begin to merge, so that we feel engaged and committed as part of a whole in which it is possible to share resources, emotions and innovations. With this four Cs completing the framework, we like to invite Professor Low Aik-Meng, who’s the founding pioneer of our University and the founding Dean of Students, to lead the students to come on stage to present a university gift to our honorable host and for us to begin our singing to the people of Myanmar to say a big thank you. The songs are “If We Hold On Together” and “This is Home”. PS3: Below is an article that we shared with one of the entrepreneurs in Myanmar whom we believe has the potential to rise to become the wealthiest in the nation, much like Philippines’ Henry Sy of SM Investments (SM PM, MV $14.2bn) and SM Prime (SMPH PM, MV $10.9bn), and John Gokongwei of Universal Robina Corp (URC PM, MV $9.5bn) and JG Summit (JGS PM, MV $10.3bn). “A business built on a deeper purpose may not dominate the economic landscape but it is a long-distance runner in it, outliving flashier outfits built on profit maximization”, ruminated South African Bamboo innovator Raymond Ackerman, who built Pick n’ Pay from four small stores in 1966 to a retail empire with sales of S$10 billion and listed on the Johannesburg Stock Exchange with a market capitalization of over S$4 billion. Ackerman was also rated by Financial Times as among the World’s Top 100 Most Respected Businessmen. Ackerman recalled the ripple of disbelief among his classmates when his lecturer, Professor WH Hutt, later heralded as one of the “Economists of the Century” by the Wall Street Journal, opened their lesson with these words: “Most of you are here to make money, but you won’t. Not unless you have a moral mission”. This view became the cornerstone of the Pick n’ Pay philosophy in how Ackerman builds and grows his business based on the principles of “consumer sovereignty” in the turbulent and complex environment of South Africa, as he tackled iniquitous cartels and break price monopolies to bring food and other goods at lower prices to the society. For instance, in the 1960s, whenever Ackerman tried to sell bread below the regulated price, he was warned that he would be fined ten rand for every cut-price loaf of bread he sold. He fought back by harnessing public outrage and the government had no choice but to allow retailers like Pick n’ Pay to sell bread at lower prices. The late retail giant Sam Walton, whom the world’s greatest investor Warren Buffett felt was the greatest CEO of all time, was initially a discount retailer with no food department. Sam was searching for the best hypermarket format so as to make better things ever more affordable to people of lesser means and he was inspired after touring Pick n’ Pay’s hypermarkets in South Africa. Sam replicated the idea in America and worldwide with a capable team and scalable infrastructure, resulting in Wal-Mart’s astounding multibagger success to over S$200 billion in market capitalization from its initial listing size in 1970 of S$40 million. It is striking how these exceptional Bamboo Innovators in South Africa are able to integrate their business with a deep-seated desire to serve humanity in some meaningful way by bringing what belongs to the privileged for the masses to enjoy. South Africa is the first country to bring the cellphone to the masses through prepaid billing. Cellphones were sold based on contracts all along and owing to the apartheid legacy, black people were not on the systems that checked bank accounts and creditworthiness, and hence could not sign up for mobile phone contracts. Alan Knott-Craig, the former CEO of telecom operator Vodacom, had a “reckless” idea in prepaid billing, and launched the prepaid system in November 1996. Today, at least 90 percent of South African customers, or nearly 45 million users, are prepaid customers. The technology Vodacom developed was adopted worldwide and now serves more than 2 billion users internationally. Vodacom opened up the market to millions of people who would otherwise have been excluded. Naspers CEO Koos Bekker brought pay TV to South Africa in 1984, the first country outside of America to have such entertainment, connecting millions to “where magic lives”, their famous slogan. Naspers is an international media conglomerate with a market capitalization of S$30 billion. Its pay TV platform, with flagship entertainment and sporting channels M-Net and SuperSport, has a subscriber base of 4 million homes in 48 African countries. Amongst its international media businesses, Naspers has a 35 percent stake in HK-listed Tencent, the dominant instant messaging QQ platform in China for over 600 million users. Naspers reaped more than 60-fold returns from their 2001 investment as Tencent’s market capitalization surged to over S$60 billion presently since its listing size of S$1 billion in 2005. Naspers also has a 28 percent stake in Mail.ru, which in turn has around a 2.4 percent interest in Facebook and stakes in internet properties with tremendous marquee value such as Zynga and Groupon. Ackerman also cautioned against the biggest temptation facing all entrepreneurs: Never treat your business as a personal piggy bank. “Many entrepreneurs, starry-eyed at the sight of cash flowing in, will rush out to buy themselves matching BMWs, with only a vague sense of the actual expenses that go into their business. Some even rationalizes that it is the owner’s right, after all the stress and strain of getting the business off the ground and keeping it afloat! The business should never be a vehicle to fund your lifestyle, but a healthy entity able to pay you a salary, no matter how meagre, with profits ploughed back into the business”, Ackerman said emphatically. All of these extraordinary Bamboo Innovators have something in common – they witnessed first-hand the problems that beset the masses and wanted to build a business to provide useful products and services. And they are not contented to stop at $10m, $100m, or even $1 billion, like most businesspeople who rush to buy fancy property and cars for themselves. These South African Bamboo Innovators want to build and scale their businesses so that they can give more. Only when we have the desire to give, then can we want to persevere in building something meaningful. This urge to build in order to give is the magnetic north to scale a Bamboo Innovator and they work obsessively to realise this vision. Bamboo Innovators are alert to existing paradigms of how things ought to function and behave in the marketplace. It is this alertness that leads to their discovery through their strong conviction and belief that they can do it significantly better – and also the real reason why they build their business with a long-term view, rather than to use the business as a vehicle for personal enrichment. Just like how Sam Walton “discovers” the anomaly of retailers overcharging the customers and how customers are underserved – and seeks to correct things by being a champion of the customer with Wal-Mart’s “Everyday Low Prices” by passing along cost savings back to the customers.